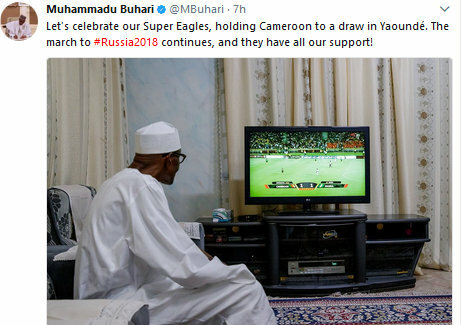 The president of Nigeria, like most Nigerians, is a big fan of football. Apparently he watched the Nigeria vs Cameroon match of yesterday and was happy for our football team. The match ended in a draw of 1-1. In related news, the president has revealed he came back to Nigeria to make life better for Nigerians . He is said to have made the statement in Daura, Katsina State while receiving farmers and other people from the State.